Sunday jazz at The Eagle Tavern was a regular haunt for us in the early 2000s when we lived in Rochester in Kent. The local jazz club worked its socks off to secure a programme of first class trios and quartets. We were never members. No one even asked us to join, but for the price of a few raffle tickets we could sit with a glass or two of good Kentish ale and the Observer crossword and enjoy some of the best jazz musicians around. Bands would drive down from London to perform at The Eagle. 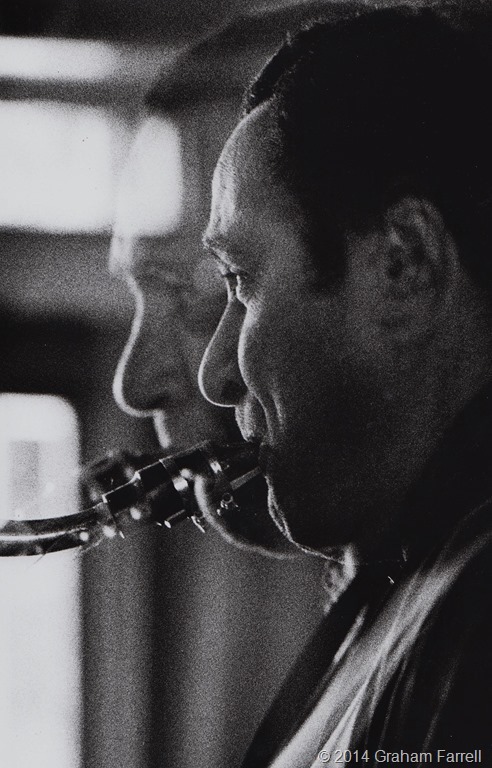 Gildad Atzmon, Renato D’Aiello, Derek Nash, Alan Barnes – all top names in British jazz – were among the musicians who often came to play for a couple of hours over a Sunday lunch-time. In return they received nothing more than a pub meal and the raffle takings, but they came because they knew that every note they played would be listened to, appraised and appreciated by the dedicated members of the Medway jazz club. Besides which, it was a good place to warm-up for their paid Sunday night gigs back in the capital. Unfortunately the Farrell filing system – both mental and physical, failed dismally when trying to access the name of the double bass player rendered severally above. For which apologies all round, and most especially to the musician himself. To make up for this omission here is Gilad Atzmon, first in whimsical mode, then a more serious piece. Posted on January 27, 2014 January 28, 2014 by Tish Farrell	This entry was posted in Jazz, Music, photography and tagged black & white, British Jazz Scene, Eagle Tavern Rochester, Gilad Atzmon, Graham Farrell, live jazz, photography, tagged 'D'. Bookmark the permalink. ← Mao at the Met: a disturbing juxta-position? 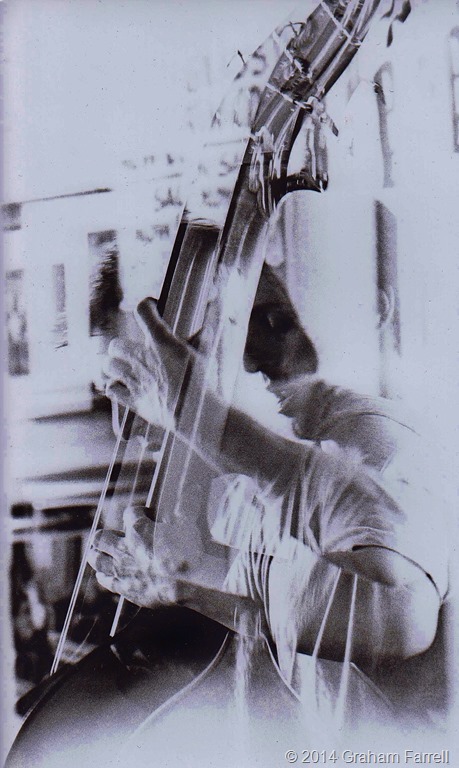 I love the black and white photos and double exposure effects – reflecting the dreaminess of jazz. I will pass your comments on to G. He will be so pleased. Thanks so much. It was worth raiding G’s photo file, shot with a real camera too! An interesting post for me. I went to the Medway College of Arts in Rochester back in the early sixties….when the college was housed at East Gate….There were several fabulous small jazz clubs, in cellars etc. (no health and safely in those good old days:) Thanks so much. Janet. Glad to bring back some good memories, Janet. Medway is an interesting neck of the woods. All sorts of resonances. Rochester is a really good art college, isn’t it? I had a friend you studied ceramics there, but that was probably in the early 70s. Well thank you very much. Glad you liked the jazz.